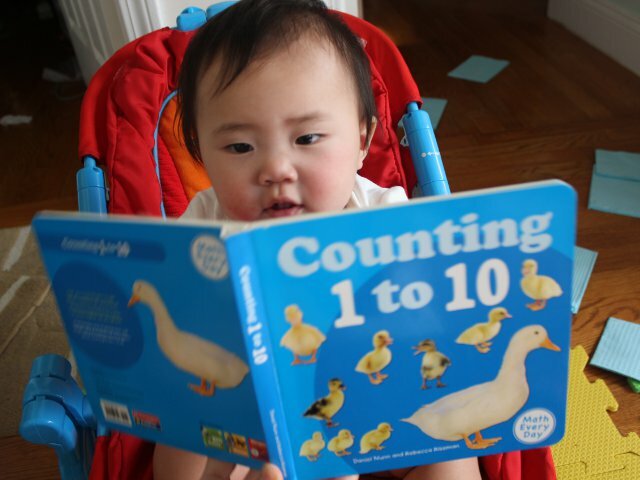 Even though Arya is too young to count by herself, I still enjoy reading lots of different counting books to my baby. Counting 1 to 10 by Daniel Nunn and Rebecca Rissman is a basic counting book that relies on large, real-life pictures to draw the interest of young children. Bright colors and realistic pictures kept Arya’s attention for the duration of the book. Each page of Counting 1 to 10 has a large picture on one side with a simple rhyme on the other. Similar to most other counting books, each page is based on one number with both the text and the picture focused on the number. While short at just ten interior pages, the book was interesting enough to entertain Arya. Large, full-page pictures combine realistic scenes with bright-colored backgrounds. I thought the first page with the big cupcake was particularly attractive, but Arya seemed to enjoy the six, juicy, red strawberries even more. Text consists of an A/B/C/B rhyming pattern of four lines on each page. Pages are not related to each other so the book is essentially ten distinct, one-page books each focused on a single number. The corresponding picture shows a precise number of elements matching the number identified in the text. The authors chose an odd font for the interior text. While most pictures display scenes of real-world objects, the font looks better suited for cartoon graphics than a physical book. For most pages the black font against white background presents a clear contrast. However, the page with sheep is hard to read with white font against the green scenery. Counting 1 to 10 is a good book to teach the basic process of counting to young toddlers. Even younger babies will still enjoy the bright colors and interesting pictures. Older children who are learning to read will appreciate the sing-song rhyme throughout the text. Counting 1 to 10 costs (including shipping) under $7 new and under $4 used from Amazon.